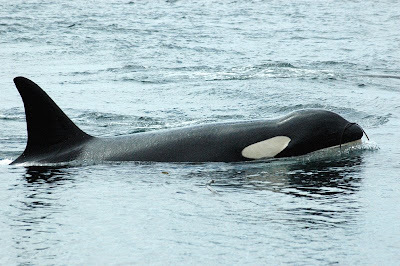 Orca Watcher: Run, Monika, Run! The Southern Residents have been out of the area since last Friday. I called Jeanne this morning to see if she wanted to work on one of our photography projects. When she didn't answer, I should have taken that as a sign that something was going on. Luckily, she called me right back. The entirety of our phone conversation was: "Hello?" "Get here. NOW!" "Okay!" I grabbed my camera bag and rushed out the door. I drove to the lighthouse (just 5 mph over the speed limit) telling myself that if I miss them, I miss them. It's happened before, and it will happen again. As I approached Hannah Heights, where I get a good view of the water, I saw three dorsal fins heading north. I can still make it! I zoomed on (10 mph over the speed limit now). I could have pulled out at land bank, but something compelled me to go all the way to the lighthouse. When I pulled up at Lime Kiln, the lower parking lot was full so I made my own parking space, grabbed my bag, and rushed towards the trail. Someone yelled "You better hurry Monika!" I don't even know who it was! But I called back over my shoulder, "I know! I know!!" It seemed like the entire pod swam through the kelp in one large group. It happened to fast, but I was clicking the entire time and got some awesome photos. Here are a few of my favorite kelping shots. 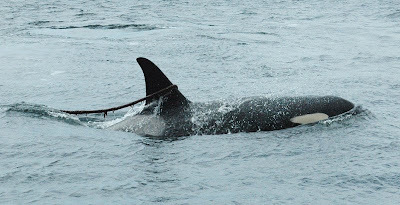 The first one is Ophelia (L27) with kelp hanging over her nose! One of the coolest parts of the experience was that this was the first time I got to listen to the whales live over my MP3 player. Inspired by others, I bought an MP3 player that has an FM receiver and FM recorder, so in addition to hearing the whales vocalize on 88.1 FM from the lighthouse while they're going by, I was able to make a recording of what was a very talkative group of whales today! It looks like I can upload audio onto this site if I make it work like a podcast, so my goal tonight is to figure out how to do that and put a clip up for your listening pleasure by tomorrow. It was amazing how abruptly the vocalizations stopped after they passed the hydrophone - I guess their calls are really directional! Cool blog! You have some great shots. I've added your blog to my list. Kinda fun this blogging business. PS. Are you coming to see Jeff Hogan tomorrow eve @ TWM? I know, I'm really enjoying blogging! Thanks for the link back, and I'll definitely be there to hear Jeff. Thanks for the compliments! I'm glad you like the layout, too. There will probably be some more tweaking over the next month or so. He Monika, it was a great day there. Nice to have spoken to you. 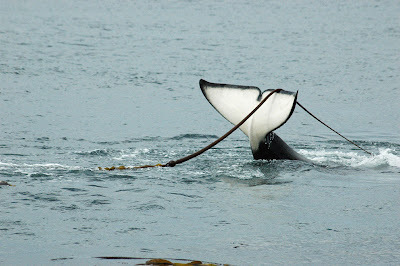 I have some photos to check out, actually, one of my frames has the whale eating the kelp as it looks lol. Never knew they are into sushi wraps! I will drop you some photos in your mail. Peter, it was nice to chat with you too! I look forward to seeing some of your shots from that day.